The supply of homes for sale in St Louis continues to fall making it even more of a challenge for the home buyers out there while making it pretty easy on sellers. For the past couple of years we have seen homes, that were properly priced and marketed correctly, sell often on the first day, or within the fist few days, of coming on the market for sale. In fact, more and more it’s become common for homes to sell before actually even hitting the market officially. Judging by the market stats, it’s probably not going to get any better for buyers anytime in the near future. As the chart below shows, the St Louis 5-county core market in March dropped to a 2.5 month supply of homes for sale, the 2nd lowest level in over 10 years. Back in June, 2016, the supply of homes for sale dropped to 2.37 months. As of March, there was a 3.17 month supply of homes for sale in Jefferson County, down from 5.5 months the month before and the lowest level in over 10 years. 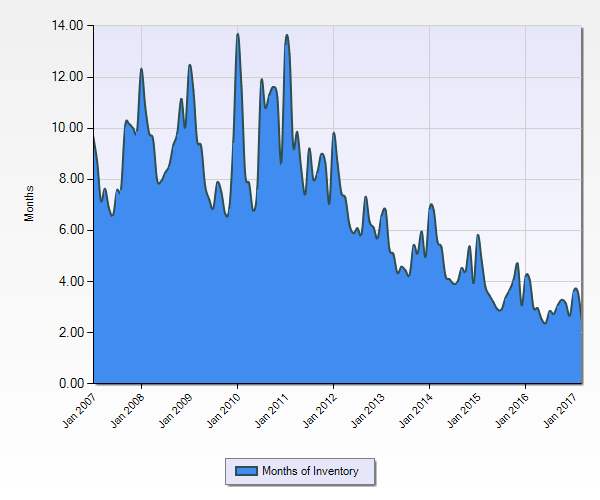 Franklin County, with a 4.10 month supply of homes for sale, is at it’s 2nd lowest level in over 10 years, St Louis City/County, at 2.47 months, is at the 3rd lowest level in over 10 years and St Charles, at 1.91 months, is at its 4th lowest level in over 10 years. Sell your house fast, for the highest price and pay as little as 3.95% total commission! Sellers, what are you waiting for? With low inventory, solid prices, the spring season and a steady stream of buyers, now is a GREAT time to be a seller and the best I’ve seen in well over a decade! Take advantage of the market and leverage it to save yourself money on the listing…find out more at the links below. StlSellersAdantage.com – learn How To Sell Your Home For The Highest Price In The Shortest Amount Of Time! FairCommissionRate.com – Why pay 6% or 7% for a full-service real estate professional in this market? That is NOT necessary! Report Says Realtors’ Existing Home Supply Understated by "Millions of Homes"